Eriocaulon sp. 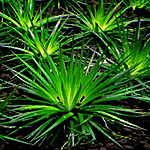 'Shiga' is most beautiful Eriocaulon from Japan. It is a non-flowering type of Erios which means that splitting can be spaced out. Eriocaulon sp. ‘Shiga’ is a low maintenance plant but with proper condition, it can grow into a great mid-ground for any aquarium types. We recommend strong lighting, rather soft water, a type of Aquasoil as substrate and good CO2 supply (about 20-30 mg/L). You will get one young plant. This item can be shipped ONLY to Europe.